Home » News » COMING SOON: The Danish Pioneer’s Big Holiday Issue 2014! COMING SOON: The Danish Pioneer’s Big Holiday Issue 2014! The Danish Pioneer Newspaper staff is currently working on its extra-large, extra-special 2014 Holiday Edition, which will again be printed in FULL COLOR on ALL PAGES this year! This special edition is looked forward to by readers and is filled with news, pictures, ads and greetings. In 2013, The Danish Pioneer began printing on a larger format, featuring an 17-inch tall x 11-inch wide page size and higher quality paper. If you haven’t subscribed yet, now is a great time to join The Danish Pioneer Family! 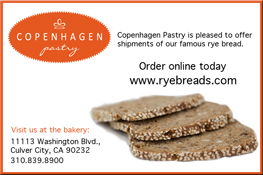 Also, if you haven’t already done so, you still have time to place a holiday greeting or advertisement in The Danish Pioneer’s 2014 Holiday Edition. DEADLINE: November 15, 2014. Prices are economical, starting at $8.00. If you are interested in the 2014 Holiday Edition Advertising Form, please send an e-mail to Editor Linda Steffensen at dpioneer@aol.com. Your annual support of The Danish Pioneer Newspaper’s print edition helps ensure the continuation and preservation of the oldest Danish-American newspaper in the USA, Den Danske Pioneer (The Danish Pioneer), which was founded in Omaha, Nebraska in 1872 and is today published in Hoffman Estates, Illinois. 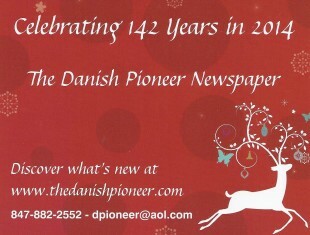 As a subscriber to The Danish Pioneer, you also get the ADDED bonus of our FULL COLOR holiday print edition and your support allows us to continually expand The Danish Pioneer’s colorful and informative website at www.thedanishpioneer.com.